Pasadena is a city in Los Angeles County, California, United States. 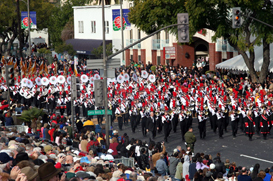 Although famous for hosting the annual Rose Bowl football game and Tournament of Roses Parade, Pasadena is the home to many scientific and cultural institutions, including the California Institute of Technology (Caltech), the Jet Propulsion Laboratory, Pasadena City College (PCC), Fuller Theological Seminary, Art Center College of Design, the Pasadena Playhouse, California School of Culinary Arts Pasadena, the Norton Simon Museum of Art, and the Pacific Asia Museum. As of 2009, the estimated population of Pasadena is 143,667, making it the 168th-largest city in the United States. Pasadena is the seventh-largest city in Los Angeles County, and in 1886 became the first to be incorporated in Los Angeles County, largely as a ploy to get rid of its saloons. It is one of the primary cultural centers of the San Gabriel Valley. Eagle Rock is a neighborhood in northeastern Los Angeles, California, United States. According to “Mapping L.A.” from the Los Angeles Times, Eagle Rock’s average income is $67,253 per person, considered above average for the County of Los Angeles. Eagle Rock was incorporated as a city in 1911 and the area was annexed into the City of Los Angeles in 1923. Eagle Rock is bordered by the city of Glendale on the north and west, Highland Park on the southeast, Glassell Park on the southwest and the cities of Pasadena and South Pasadena on the east. Major thoroughfares include Eagle Rock Boulevard and Colorado Boulevard, with Figueroa Street along the eastern boundary. The Glendale and Ventura freeways run along the district’s western and northern edges, respectively. A massive boulder at the district’s northern edge contains an indentation that casts a bird-shaped shadow on the rock at certain times of day, giving the neighborhood its name.